There’s definitely no shortage of books about the American Civil War. In fact, according to the Library of Congress Civil War Desk Reference, over 70,000 books have been published on various aspects of the Civil War and more are being published every day. As result, if you want to learn more about the Civil War, it may be hard to know where to start. To help you out, I’ve compiled a list of what I think are the best books on the Civil War. These books mentioned here are some of the best-selling books on the topic and all have either a four or five star rating on sites like Amazon, Goodreads and etc. 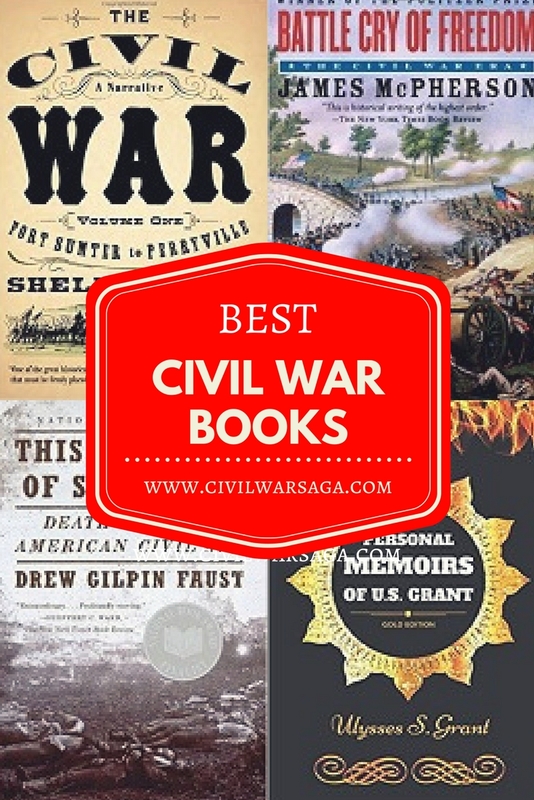 I have also used a lot of these books in my research for this website and can personally recommend them as some of the best books on the Civil War. Published in 1988, this book is considered one of the best books ever written about the Civil War. The book discusses the political, social and military events of the Civil War era, starting with the events that led up to the war, such as the Dred Scott case and John Brown’s raid on Harper’s Ferry, and ties them all together to explain why the war occurred in the first place. The book explains that both the Confederacy and the Union professed to be fighting for freedom in the Civil War but each side had different ideas of what freedom was exactly. These multiple meanings of slavery and freedom and how they changed over the course of the war is the central theme of the book. James McPherson is a Professor Emeritus of American History at Princeton University, was also president of the American Historical Association in 2003 and is a member of the editorial board of Encyclopedia Britannica. McPherson has written numerous books about the Civil War era such as Abraham Lincoln and the Second American Revolution; and For Causes and Comrades: Why Men Fought in the Civil War; and Crossroads of Freedom; and Ordeal By Fire: The Civil War and Reconstruction. Originally published in three individuals volumes in 1958, 1963 and 1974, these books are one of the most comprehensive series on the Civil War. Although the books do touch upon social and political aspects of the war, they are mostly a military history. The three volumes of the series are: Volume One: Fort Sumter to Perryville, Volume Two: Fredericksburg to Meridian, and Volume Three: Red River to Appomattox. Volume One: Fort Sumter to Perryville discusses the early days of the war up to the Battle of Perryville in October of 1862. It includes the famous battles of Antietam, Bull Run and Shiloh as well as lesser known engagement such as the battles of Ball’s Bluff, Fort Donelson and Stonewall Jackson’s Valley Campaign. Volume Two: Fredericksburg to Meridian discusses the battles between late 1862 to 1863 and includes the battles of Fredericksburg, Chancellorsville and a lengthy chapter on the Battle of Gettysburg. Volume Three: Red River to Appomattox discusses the events during the final year of the war which includes Sherman’s March to the Sea, the assassination of Abraham Lincoln and the Confederate’s surrender at Appomattox. Some critics though dislike Foote’s lack of footnotes while others state that his attention to the politics, economics and diplomacy of the war is lacking at best. Shelby Foote, who died in 2005, was a historian and a historical novelist who wrote numerous books about the Civil War, such as Shiloh: A Novel and Stars in Their Course: The Gettysburg Campaign, June-July 1863. Foote also appeared in Ken Burn’s noted documentary The Civil War, in 1985. Published in 1953, this book discusses the final year of the Civil War which includes the battles of the Wilderness, Bloody Angle, Cold Harbor, the Crater as well as the final moment at Appomattox. Although a part of the Army of the Potomac Trilogy, this third volume is the most highly rated of the series and won both the Pulitzer Prize and the National Book Award for excellence in non-fiction. Bruce Catton, who died in 1978, was a historian, journalist and the first editor of American Heritage Magazine. Catton wrote many books about the Civil War such as the American Heritage Picture History of the Civil War; Grant Moves South; and Grant Takes Command; and This Hallowed Ground. Ken Burn’s 1985 television documentary The Civil War drew heavily on Bruce Catton’s books, and led to a revival of interest in his books. In 1984, the Bruce Catton Prize was created and awarded biennial to notable authors for lifetime achievements in the writing of history. Published in 1983, this best-selling book describes the events of the Battle of Antietam. Using a number of primary sources, such as diaries, dispatches and letters, the book recreates the events of the battle from the perspective of both the soldiers and the leaders on both sides of the conflict. Stephen W. Sears is an author and former editor of the American Heritage Publishing Company. Sears has written numerous books about the Civil War including Gettysburg; Chancellorsville; and the best-seller Lincoln’s Lieutenants: The High Command of the Army of the Potomac. Published in 2008, this book discusses how widespread death during the Civil War affected society as a whole. The New York Times described the book as “extraordinary” and “profound” and stated that it helps modern readers better understand the full impact of the war on American society and culture. Yet, the Washington Post review also argues that some of Faust’s claims, such as her argument that the large scale death permanently transformed American politics and beliefs, are less convincing and lack the hard evidence to back it up. The book is also the basis for a 2012 Emmy-nominated episode of the PBS American Experience documentaries titled “Death and the Civil War,” which was directed by Ric Burns. Drew Gilpin Faust is a historian, history professor and the 28th president of Harvard University. Faust also currently serves as the Lincoln Professor of History at Harvard, is the founding dean of the Radcliffe Institute for Advanced Study at Harvard and previously served as the Annenberg Professor of History at the University of Pennsylvania for 35 years, the president of the Southern Historical Association and served on the executive board of the Organization of American Historians and the Society of American Historians. Faust has written many books about the Civil War including Mothers of Invention: Women of the Slaveholding South in the American Civil War; and the Creation of the Confederate Nationalism. Published in 1885, this memoir by Union general Ulysses S. Grant is one of the best primary sources on the Civil War. Although the book isn’t exclusively about the Civil War, since it also discusses Grant’s childhood and early life, about three-quarters of the book, which is about 290 pages, is devoted to the war and is told through Grant’s perspective. The book is not an overview of the entire Civil War though, since Grant didn’t personally witness every battle or event, but what it does cover is a fascinating, first-hand account of the various battles, campaign strategies and military operations he was involved in. Written between 1861 and 1865 and originally published as a series of articles in the Saturday Evening Post in 1905, this diary by Mary Chestnut is a personal narrative of the Civil War, making it a unique primary source on the war. Mary Chestnut, the daughter of a wealthy plantation owner and politician and the wife of an aide to the Confederate President, Jefferson Davis, lived in Charleston, South Carolina and wrote about the prominent people and the politics of Confederate White House. When her husband, James Chestnut, Jr., became an officer in the Confederate army, Mary accompanied him on his missions and recorded her observations of Confederate military operations in her diary. This list is not the be-all and end-all of Civil War books and is intended to be merely a starting point for anyone wanting to learn more about this era. As I’ve mentioned, there are tens of thousands of more books on the topic so feel free to explore the many other books out there. Wagner, Margaret E., Gary W. Gallagher, Paul Finkelman. The Library of Congress Civil War Desk Reference. New York: Simon & Schuster Paperbacks, 2002. Print. “Office of the President: Biography.” harvard.edu. Harvard University, n.d. Web. 19 Jun. 2017. Ward, Geoffrey C. “Death’s Army.” nytimes.com. New York Times, 27 Jan. 2008. Web. 19 Jun. 2017. Gaffney, Elizabeth, Benjamin Ryder Howe. “David McCullough, The Art of Biography No. 2.” theparisreview.org. The Paris Review, Fall 1999. Web. 19 Jun. 2017. Martin, Douglas. “Shelby Foote Historian and Novelist Dies at 88.” nytimes.com. New York Times, 29 Jun. 2005. Web. 19 Jun. 2017.